Entrepreneur Jim Rohn was not specifically describing the practice of investing with this quote but it fits perfectly. The harsh reality of investing is that there will be good times and there will be bad times. Getting greedy in the good times or failing to maintain a discipline will almost certainly result in regret during the bad times. We don’t know when the current bull market will become a bear market but we know it will happen. Our advice? Tend to the items that matter and avoid having the following four regrets when, eventually, there is a bear market. 1) You’ll wish you employed an appropriate portfolio allocation for your unique situation. In early 2009, I received a call from a friend – we’ll call him Will. The “financial advisor” for Will’s parents had 100% of their retirement portfolio invested in stocks. Will’s parents were in their mid-60’s and were mentally preparing to begin retirement. That was, Will explained, until their portfolio lost roughly half its value from a few months earlier. Hopes of retiring before age 70 were dashed. I know Will’s parents were not the only baby boomers beset by such a financially devastating turn of events. I received calls from and spoke with other families facing similar dilemmas. Sadly, some were already retired. None of this is to say that their respective financial advisors should have seen the great financial crisis coming and trimmed back their allocations to stocks. Not even close. The reality is that Will’s parents and others like them should have had an allocation that better fit their situation long before the great financial crisis played out. As proximity to retirement narrowed and their ability to withstand a 40% or 50% loss declined, they should have had an increased allocation to conservative assets. I don’t know enough about Will’s parents to assess precisely what their investment allocation should have been but it was clearly something less than 100% stocks. Waiting to adjust the risk level of your portfolio is like waiting to buy flood insurance. You can procrastinate as long as you like but when the heavy rain starts, it’s too late. Do yourself a favor and evaluate right now whether the risk of your portfolio fits with your age, near-term cash needs, proximity to retirement, and your risk tolerance. 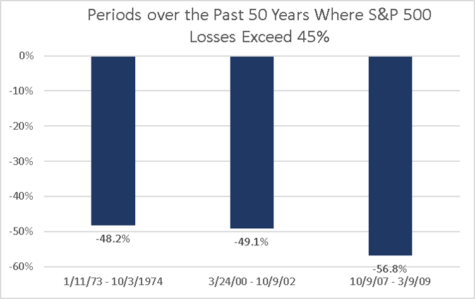 If you are closing in on retirement and you have most of your investments in stocks, consider how a 50% loss would impact your plans. Don’t think that you will be able to see the market sell-off coming and get out just in time. Don’t think that just because you have 20 mutual funds, that you are well-diversified and can’t lose half your wealth. Don’t regret winding up like Will’s parents. 2) You’ll wish you rebalanced your portfolio in the past three years. We often describe rebalancing as the blocking and tackling of investment management. There’s nothing glamorous or exciting about it. No one brags at the office water-cooler to their coworkers about how they rebalanced their portfolio yesterday. The talking heads on CNBC don’t spend time advertising the importance of paring back winners and adding to the allocations that have failed to keep pace. Like the blocking and tackling of a football game, rebalancing is almost never a celebrated activity. Yet the blocking and tackling in a football game and the systematic rebalancing of portfolio management are among the most important and valuable activities of each endeavor. If you have a targeted allocation to stocks and bonds that’s recorded somewhere and you spend some time each year ensuring that your aggregate portfolio falls in line with those allocations, then pat yourself on the back. You are in the minority. Because rebalancing isn’t celebrated or glamorous, very few investors consistently do it. Instead, people think about what they’re going to buy next or how they’re going to allocate their future 401k contributions. To understand why failing to rebalance can be problematic, consider an investor named Molly who, five years ago, moved 50% of her assets to US stocks and 50% to US bonds. She knew that she could not stomach a dramatic loss. Molly prudently set an appropriate allocation. However, by not rebalancing in the subsequent five years, Mr. Market took control and shifted Molly’s stock allocation to nearly double that of her bond investments. Stocks went to 64% of her allocation and bonds to 36%. The risk of her portfolio increased by 20%. It wasn’t because Molly did anything. It happened because she did nothing. During the next bear market, investors will regret having failed to diligently rebalance over the past five years. Not only have stocks risen dramatically in the portfolio and, resultantly, increased the portfolio risk, but those investors are now five years closer to retirement. This makes for a bad combination that will, unfortunately, end poorly for many. 3) You’ll wish you set a risk level that you could stomach. Stocks go up. This is fun. You convince yourself that a little juice in your portfolio is a good thing. Stocks go down. Less fun. Stocks go down more and you realize that you weren’t ready to see all the red numbers on your statement. You’re stressed. You lose sleep. You eventually sell because you cannot bear the emotional toll of more losses. To be clear, there is nothing wrong with high aversion to risk or, said differently, a low financial pain threshold. Some people are just inherently predisposed to treat losses differently in the same way that some people have a fear of heights. Take care not to let a bull market lull you into a more aggressive allocation than you can handle when the gains turn into losses. 4) You’ll wish that you had properly diversified. History will refer to the 2000-2002 period as a bear market. Investors may even refer to it as a market crash. The bursting of the tech bubble, an outbreak of accounting scandals, an economic recession, and the tragedy of 9/11 led the S&P 500 Index to lose nearly 50% of its value between mid-March 2000 to September 2002. While this period is remembered as a terrible stretch for stock market investors, that paints an unfair picture. Yes, individual investors and many mutual funds who concentrated in brand name growth companies like Amazon, eBay, Yahoo, Qualcomm, Enron, and Cisco were clearly crushed during this stretch – losing more than half their wealth. But investors who maintained a diversified portfolio that included domestic small companies weathered the period quite well. Sharp losses in the large growth stocks were offset nicely by gains in small company value stocks as demonstrated below. This not-too-distant period provides a useful reminder of why diversification matters. And to be clear, owning 25 different large cap stock mutual funds from 25 different fund companies is not the kind of diversification we’re talking about here. That’s the kind of diversification that would have still caused you to lose more than half your wealth between 2000-2002. What investors will likely regret during the next bear market is having a bunch of stocks, mutual funds, or ETFs that represent the bulk of their portfolio and all tend to zig or zag at the same time. Expect that if your investments are all going up in unison during the bull market, they will all plummet together during the bear market. Diversification is known as the only free lunch of investing. When there is a free lunch, act like a broke college student and pile your plate high. If you don’t have some investments in your portfolio that have lackluster results over the past year, then you’re likely not diversified. No one really knows when the next bear market will happen and what the outcome will be. Do not expect to be the unique prognosticator who can foretell such events or rely on others who claim to be the unique prognosticator. Instead, act today like there could be a bear market tomorrow. Know your risk tolerance. Diversify. Employ a risk level that fits your unique situation. Rebalance. Fail to take any of these actions and you will likely wake up at some day in the future to regret it. Nice article. 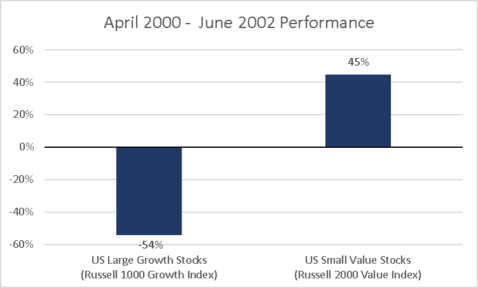 Still, Russell 2000 Value Index (small caps) went down in 2002, up only +1% in 2001, but in 2003 went up by 45%, in correlation with the market. I didn’t find that 45% for 2001-2002, could you please check again? Hi Adrian, glad you enjoyed the article. The April 2000-June 2002 period was used for the figures in the chart (noted in chart title). During this stretch, the Russell 2000 Value gained 44.7%. April – Dec 2000 was +18.3, Jan – Dec 2001 was +14.0%, Jan – Jun 2002 was +7.3%.